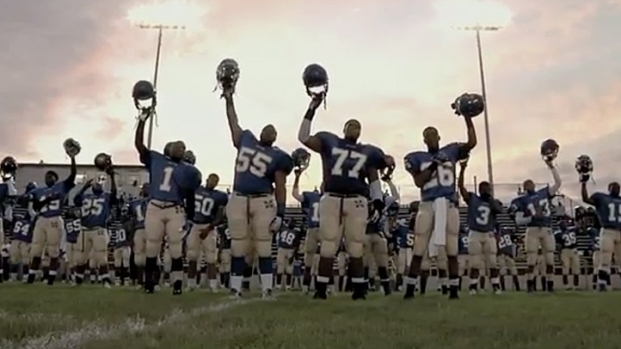 The Manassas High School Tigers, stars of "Undefeated," nominated for Best Documentary at the 2012 Oscars. On a dreary February morning, the austere hush of the Weinstein Company's West Coast office is ruptured when the Oscar-nominated directing team of "Undefeated," Dan Lindsay, 33, and T.J. Martin, 32, come bounding into the reception area with the energy of two puppies just released from their kennel. Giddily loping along, side by side, their unfettered enthusiasm is contagious and intoxicating. Speaking in overlapping, tandem sentences, you get the feeling their irrepressible glee—an effusiveness which infuses their documentary—might be particularly heightened as they find themselves included in the upper echelons of Hollywood; seated at one of Harvey's conference tables, discussing their Academy Award-nominated film. Not bad for two guys who started out in 2008 with what they jokingly describe as the "game changer" documentary, "Last Cup: Road to the World Series of Beer Pong." "I got hired to direct it and T.J. was hired to edit," Lindsay begins. "The producers just wanted a bunch of guys throwing up and we were like, 'No! Let's make a really good film!' We started working together and it quickly became apparent that our creative process and our taste are very similar." "And our work ethic, which is not very healthy, is also very similar," Martin continues, explaining that it's not unusual for the pair to work "fourteen or fifteen hours a day. We talk a lot. There will be days where we'll spend thirteen hours just talking about an edit and in the fourteenth hour we'll make a cut." Perhaps it's that shared diligent focus which brought them to this place just four years later, as they live every filmmaker's dream. Nominated for Best Documentary at this year's Oscars, the film chronicles a season of the Manassas H.S. Tigers of North Memphis, Tenn., as they the first playoff victory in the school's 110-year history. "undefeated" opens Feb. 17. "It wasn't real until yesterday when we went to the nominees luncheon and I saw Rich [Middlemas], our producer and—ahem—fellow Oscar nominee, standing next to Brad Pitt at the group photo," Lindsay grins. "I was like, 'Why is Rich standing next to Brad Pitt?'" "On my left shoulder was Steven Spielberg, on my right shoulder was Martin Scorsese. I looked up and didn't know what to do. It was like, 'Hey, man,'" Martin adds with a laugh. 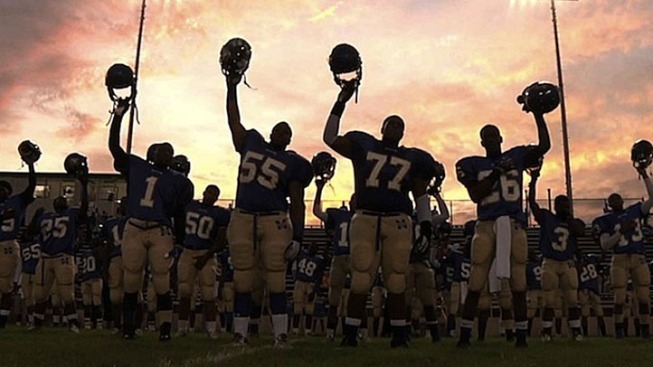 "Undefeated"—a film that made several members of the Popcorn Biz staff bawl like wee babes—follows a Memphis high school football team during a season that unfolds into a hybrid of some of the most notable football movies in recent memory; "The Blind Side," "Friday Night Lights" and "Remember the Titans." But Lindsay is quick to point out, "We never even wanted to make a sports film." "We fought it for a long time," Martin nods. The filmmakers, who "embedded" themselves in Memphis, attending every practice and shooting over 500 hours of footage, "wanted to make a very personal, coming-of-age piece. But then crazy s—t went down," Lindsay laughs. "We thought it would be a really intimate story, but then it just got bigger and bigger," Martin says. "We could have never predicted the emotional swell of this movie." That swell is a wave they'll ride all the way to the Kodak Theater on February 26.